COMPANY PROFILE: Performance Advantage Co.
PAC is a supplier of premium tool mounting systems for the emergency services industry. Included in the PAC line tool mounting brackets are items that are compliant with both NFPA 1901 and U.S. Military Grade B Shock Standards. 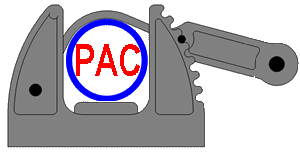 Along with our high quality tool mounting solutions, PAC extends to its clients the very best in customer service and support, as well as a lifetime warranty on all PAC products. PAC’s Handlelok is the flagship of our tool mounting and bracket line of products. It is one of our most durable and versatile brackets, and has been in use in the Fire Industry for over 20 years. In addition to the standard black strap, PAC also offers this item with either a Hi-Viz yellow or Safety orange strap option. As with all PAC products, the Handlelok comes with a lifetime replacement warranty should it fail while in normal, intended use.